Since I don't have time to have any of the works properly framed before showing them on May 4th, I've come up with the above solution to the problem of how to display the works. 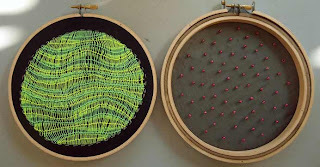 Inexpensive wooden embroidery hoops make great temporary frames for the round works, which are approximately 15cm (six inches) diameter. 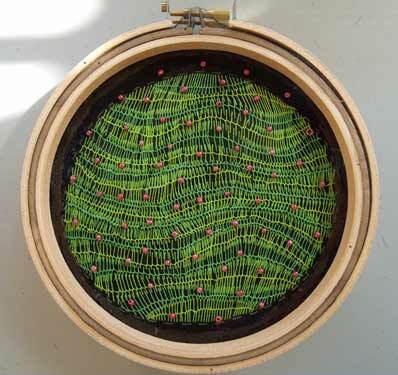 Placing the screw mechanism at the top gives a great place to hang them on hooks or using fishing line. 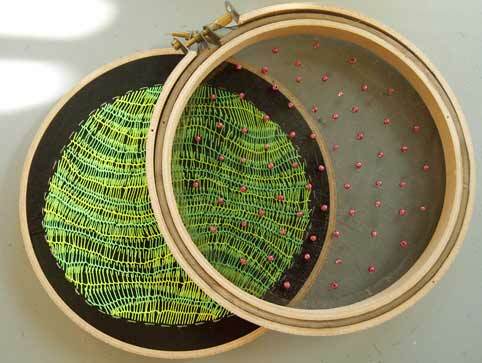 For the problematic double-layered work shown here, I've placed the opaque fluoro stitching work in a hoop, then laid the sheer organza beaded layer upside down in another hoop (so the inner hoop is on top rather than underneath). I've used temporary adhesive to glue the edges of the organza fabric to the outside of the hoop, and that's why there's currently a third hoop around the outside, to hold the fabric in place while the glue takes (I hope! ).